The Millet Public Library Board and staff are excited about the changes to the library building. 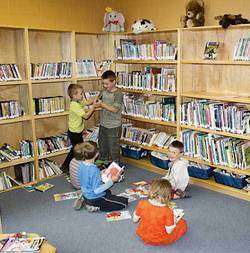 The town of Millet has painted the junior section, made repairs, replaced a sink and generally helped make the Library a warm and friendly looking space. Thanks to everyone involved. Library was replacing and updating their library and we were able to obtain their Junior Shelving to make our Junior section look awesome. to the Board and Staff of Beaumont Library!